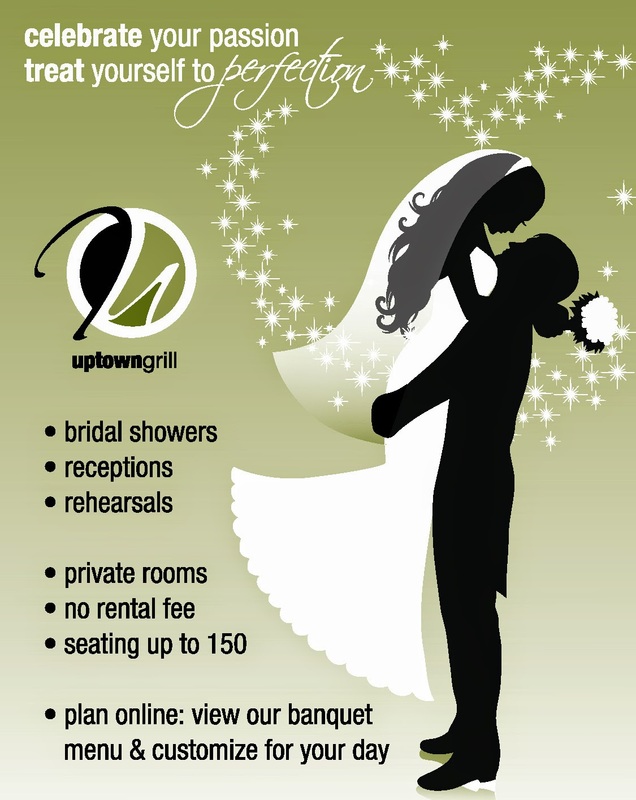 Uptown Grill Blog: Calling All Brides and Grooms! We at Uptown Grill pride ourselves on being able to accommodate parties and budgets of all sizes - big or small. We like to make the important events in your life stress free and easy to plan. Why not let us celebrate with you and help to plan your perfect wedding? For the first time ever, you can find us at our booth at the WLPO 35th Annual Illinois Valley Bridal Show this Sunday, January 25, 2015 in the Peter Miller Wing of Illinois Valley Community College. Uptown employees and banquet experts will be available to help you plan the perfect bridal shower, rehearsal dinner, reception, or any other event you may need to host to make your wedding celebration special. We are prepared to guide you through selecting your menu, checking dates for availability, taking deposits, booking parties, and answering any other questions you may have! Guests who stop by will also have the opportunity to enter to win a dinner for two at our restaurant and check out the place for themselves!